Since 2015 began, the winter in Jackson Hole, Wyoming, has been the mildest in the memory of most folks. As a result, the almost snow-free National Elk Refuge would be expected harbor only scattered elk, and the elk there would not be chowing down on compressed alfalfa pellets. They would not be fed. In 2007 the Bison and Elk Man-agement Plan for the next 15 years was adopted for the elk refuge. One of its goals was to reduce the number of fed elk to 5000. The purpose was to reduce the amount of brucellosis transmitted and to forestall the appearance of dread chronic wasting disease (CWD). The higher the number of elk concentrated unnaturally on the Refuge, the more opportunity for disease transmission. Now in the mildest of winters with CWD closing in on Jackson Hole, the number of elk currently being fed is a remarkable 8390. This is the most since the 8494 fed in 1998. This figure is not all that exceptional though because last winter 8296 were on feed at the maximum. Progress toward 5000 is slow. Progress toward 5000 could be called non existent. The wolves are there. The lions and bears are there. How should this population be controlled? It seems an obvious solution to too many elk being fed too much non-natural food is to cut back on the artificial feeding, especially in mild winters. 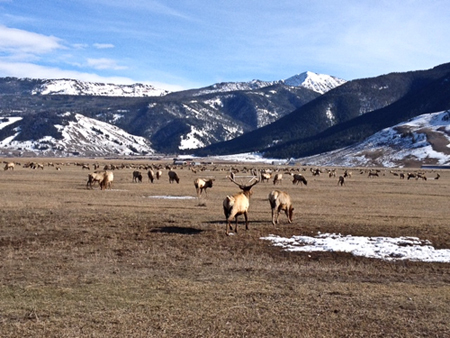 The goal of the elk management plan is to get the number of elk being fed on the Nat. Elk Refuge down to around 5,000, it is not the goal to reduce the number of elk in the ecosystem, so issuing more hunting-tags is not the answer. If you really want to knock this population down you need to cut back on artificial feeding on harsh winters. Cutting back on mild winters accomplishes nothing toward the goal of herd reduction. I believe that increased hunting targeting the refuge elk specifically is the only way to get control of this herd now. I would add that additional natural winter loss is part of the formula. The USFWS personnel need to help educate the public about the importance of natural loss of the weak, sick, and injured elk. Many of these less fit elk are kept alive by the artificial feeding of alfalfa pellets. The opposite of managing for a healthy herd in balance with the carrying capacity of the habitat. Keep the Wyoming hunting season on wolves closed and the wolves will eventually control the elk numbers. Not without help from hunters or starvation in a bad winter. Once they are down to 5000 a combination of predators and hunting might stabilize the herd. I don’t believe there will ever be many more wolves in the areas than what’s there are now because of territorial issues. The government is not trying to “keep the ecosystem’s elk herd down to 5,000” – the government plan is to keep the number of elk being fed artificially at the Nat. Elk Refuge at 5,000 – Big Difference. Just reduce the feeding and start it later and finish it earlier and no hunting will be necessary and the elk numbers in the ecosystem can remain higher than 5,000, if that’s what nature dictates. The problem with this elk herd is that it’s migration path and some of it’s winter range was blocked, long ago by ranches and now by trophy homes. Unless you can walk that back, and you can’t, they have no where else to go. Many generations of these specific elk now only know one strategy to get through the winter – go to the refuge. Yes what you recommend can work but what “nature” will “dictate” under the current very unnatural situation there is a solution consisting of a lot death by starvation and disease, some in people’s backyards literally within the city limits of Jackson. No agency wildlife manager can withstand the kind of public pressure that will generate. Lots of people like the idea of letting nature take its course until they have to look it in the eye, the eye of a puffy faced, teetering starving calf elk. Hunting is in my opinion the lessor of bad options available now. The take home message is not to let this herd get this far above objective again. There are many thousands of public land acres in the foothills above the Nat. Elk Refuge and there are many more multi-thousands of acres of winter elk habitat owned by conservation buyers, who would welcome wintering elk —- elk that are now being enticed onto the refuge by the artificial feeding. A shooting gallery of increased elk hunting on the Nat Elk Refuge (note the word “refuge”) is not the answer, nor is it the best science. Those other winter ranges and acres you mention are either already covered with elk or they are inaccessible to the Jackson elk in question. On normal winters the snow is too deep on the foothills above the refuge. You can’t just will elk to go somewhere they are not used to going and have them follow your wishes – believe me I’ve tried. Wy Game and Fish has been trying to get the Jackson elk to disperse to other wintering areas for years with very limited success. I don’t think you have a realistic perspective of the on the ground constraints presented by this locale. I don’t like the shooting gallery aspect of the current hunt there either, but I don’t know of a good alternative to it. I know it is not as simple as you would like it to be. If it was it would have been implemented long ago. Opening more of Grand Teton Park to hunting could help improve the ethics of the hunt but I’m sure you would oppose that too. I have to agree with Theo Chu on the lack of other winter range available. There just isn’t any. There is an elk feeding operation in the Gros Ventre river upstream from the Jackson herd and another feeding operation down lower on the Snake River below Hoback Junction. Jackson elk don’t have any other choices. Elk hunting in the area between Yellowstone and Jackson has taught the elk to move quickly to the elk refuge at night to escape hunters in the National Forest and in Grand Teton National Park. the 8,000 elk that show up at the refuge. Maybe the 5,000 number of refuge elk in the human derived elk plan needs to be more realistic. I spent a winter in Jackson a few years ago and the so-called elk hunt was a joke. I saw slob “hunters” shooting elk from the sides of roads. If the elk have to be killed by humans, I would prefer that sharp shooters cull excess cow elk on the refuge. There is about 150,000 acres of designated winter range in Jackson Hole (north of town), and the Buffalo Valley and the Gros Ventre Valley combined. The winter range for elk and other big game is a mix of USFS, NPS, and USFWS lands. Public lands, protected for wildlife. Teton County (2.7 million acres) is more than 97% public jurisdiction, and of the 79,000 private acres, 20,000 acres are under permanent conservation easements; most of the remainder is sparsely developed. The winter range complexes and pass through habitats for elk are connected and functional and the Gros Ventre range in particular is not utilized to capacity. Migration routes to winter ranges outside the Jackson Hole area are also functional as some radio-collared deer, elk and pronghorn show us. A lot of carefully compiled information on this issue is at http://wyomingwildlifeadvocates.orgat “Resources”, “Elk Feeding Issues”, “Detailed Q & A on elk feeding & migrations”. With CWD just over the horizon to the east of the Gros Ventre Valley, a combination of hunting harvest, predation and winter loss can reduce the herds to a healthier level hopefully before CWD arrives. Experts indicate that if artificial feeding persists in a densely concentrated elk herd, CWD prevalence will likely be amplified and move more rapidly through the region. We have choices now if we use them. It looks to me that the amount of winter range near Jackson will only increase over time as the climate continues to warm. The question to me is whether there will be a significant number of disease free ungulates to enjoy it in the near (and more distant) future as CWD moves in. Maybe not quite an equal market loss. When I have less whitetail (I almost forget what that’s like, it was so long ago – I’m in lower MI) I might still almost never eat cows, even though they’re delicious. I miss cow meat, but am glad to pay almost nothing toward the making of it. I can resist. Now, if you have cheese habits like I do, listen: I recommend rationalization (“it’s less sinful”) or not thinking about it. The milk arrives as if by magic, then you do cool things. Big fan of organic goat cheese on crackers and in home prepared dishes. “For ruminants – cows, mainly — the greatest promise involves improving animal and herd efficiency. This includes using better feeds and feeding techniques, which can reduce methane (CH4) generated during digestion as well as the amount of CH4 and nitrous oxide (N2O) released by decomposing manure. I’ll agree with Rork — there is an increasing market for meat protein that isn’t full of antibiotics and hormones — these folks won’t buy industry-produced beef. Theo- do you have ANY wildlife biology cred? Rule of thumb: a Hereford beef cow heifer put out on range to graze will consume the equivalence of almost four Mule Deer , and >two adult cow Elk , and ~two bull Elk. More winter forage in the Jackson Hole area and elsewhere might be available to wild ungulates if ranchers paid market value for its public graze. Instead, a cow on a Forest Service lease for 4 months pays the US Treasury $ 5.40 to put on 500 pounds of carcass weight , roughly $ 750 at today’s cattle carcass market rates. A ridiculous ratio. By the way , there are ZERO elk feed grounds on my side of the Continental Divide in Park County Wyoming around Cody and the Absaroka front range , and we winter a lot of elk on a mix of public-private habitat. Elk herds are about 30 percent above desired population objectives in the Cody region, and climbing, while we have a heckuva lot of human hunting , grizzly and black bears, cougars, and many wolves. P.S. — about three years ago, the Cody office of G &F had an ” emergency attrition hunt” for cow elk in December till the end of January or even into February after the generals eason . This was done specifically to kill migratory Yellowstone elk that might be bringing brucellosis to the Shoshone and Greybull River ranch country. You could buy a cheap tag for 2nd or 3rd cow elk. Those tags did not sell well. The hunt was a bust. In case Ted does not see your question, please allow me to answer in his stead. Ted was a former regional manager at Idaho Department of Fish and Game. So, yes he has wildlife biology cred. Besides that, he knows his stuff! You know, when I see crap like this, perhaps JEFF E was correct. Cody – I’m not sure what you disagreeing with me about. I think all livestock should be removed from public lands in favor of wildlife. Perhaps you should re-read my comments with greater clarity. What is the problem with issuing additional hunting licenses, ED. You are so anti hunting. I think you are right about this. The problem is the belief that feeding is needed to hold up elk numbers, plus the fact that money made from wintertime elk sleigh rides creates business support. There are also the jobs maintained by the state and the federal government feeding the elk (and bison). Gee Ralph, I don’t think I have ever seen you so passive on a wildlife issue, like the scientifically based proposals to end Wyoming’s elk feeding programs. Regarding the sleigh-rides contributing to the economy of the Jackson Hole area, please realized that the sleigh-rides and tourist viewings will continue after the feeding program has ended. The National Elk Refuge was established in 1912 because it is 24,000 acres of prime winter elk (and bison) habitat and it will continue as prime winter habitat. After the ending of the feeding program, The Nat. Elk Refuge will still have thousands of naturally wintering elk (and bison and wolves) for the tourists to enjoy. Interestingly, the circa 1910-12 determination of what is now the National Elk Refuge was a result of second-best choices and serendipity. In 1898 there was a proposal (in Recreation magazine) to protect a swath of land from Yellowstone south along the western foothills of the Wind River Range to the Red Desert as a Game Range. Then, around 1906 and a few years afterwards, the Wyoming Game Warden recommended the Gros Ventre Valley and Upper Green River Valley (about 138,000 acres)be set aside as a wintering ground for the elk. In 1906-1909, thousands of elk still wintered (without artificial feeding)in the Gros Vente Valley but most elk elsewhere had been wiped out to feed settlers, railroad crews,travelers, miners, etc.. Those elk in Jackson Hole that Steven Leek photographed in the early 1900’s were shortstopped by settlers’ vulnerable haystacks, which ironically may have prevented more massive overkill if they’d migrated out. The neat thing today, more than 100 years later, is that the Gros Ventre Valley and the Upper Green, those very lands that the early game wardens recommended for elk winter range, are protected public lands managed by the USFS. The Wind River Front pathway (mixed jurisdictions)is the migration route used by thousands of mule deer nowadays. In the future, if we make some tough decisions soon, Jackson Hole (& Buffalo Valley and the Gros Ventre Valley) will naturally winter healthier herds of elk, and some elk will migrate “out” to winter. We already see evidence from some JH elk that go to the Dubois, Wyoming, winter ranges, and a GTNP elk that went to Heise, Idaho, to winter, and some Gros Ventre elk roam into different watersheds during their lifetimes. Afterall, due to smart land protection & conservation by previous generations, these parts of the ecosystem are still connected. I don’t mean to sound passive about this issue. What I am trying to express is that the basic human problem stopping progress in reducing and ending the elk feeding is the beliefs of local people in Jackson Hole and some adjacent areas. I mean their beliefs about what would happen if feeding was reduced and stopped. They see a great loss, maybe a catastrophe, when in reality it is likely to be much less, and positive overall. “The study at Hart Mountain National Antelope Refuge (Eastern Oregon) shows just how much a system can change within only two decades of cattle removal,” said Ripple. Lloyd Dorsey – Thank you so much for the thoroughly researched and timely education you have given us on the virtues of ending the artificial feeding of elk in Wyoming. Well done! !